Wylie vs. Mongol Derby, Powered by Fleeceworks, Day 7: We Have Winners! In August 2017 writer/rider Leslie Wylie will be attempting her most fearsome feat of #YOLO yet: a 620-mile race across Mongolia. Riding 27 semi-wild native horses. Carrying only 11 pounds of gear. Relying on nomads for food, water and shelter. On a mission to help stop deforestation. To be held Aug. 9-19, the Mongol Derby is widely regarded as the toughest horse race in the world. Inspired by the Genghis Khan’s original “pony express,” there’s no trail or set route, just 25 GPS checkpoints/horse exchange stations to hit over the course of 7-10 days. Keep it here for updates on Leslie’s ride of a lifetime! Click here to read previous stories in the series. Ed Fernon and Barry Armitage cross the finish line together. Photo by Julian Herbert/Mongol Derby. After trading the lead several times not only over the past few days but in the final hour of the race, Barry Armitage of South Africa and Ed Fernon of Australia crossed the line together as co-winners of the 2017 Mongol Derby, with Jakkie Mellet of South Africa just behind them to finish third. The three riders pushed each other hard and fast throughout the event to separate them significantly from the rest of the field, and the three Southern Hemisphere riders were the only riders to finish today. Another 10 or so riders are in range to potentially finish tomorrow. Our own Leslie Wylie appears to have had a fast and efficient day on the steppe, making it to Urtuu 21 this evening with just six checkpoints to go before the finish line. A distance of 220 kilometers separated the leaders from the rear pack this morning, and the weather quickly turned hot and sunny to create challenging conditions (especially when compared to the cold, blowing rain riders faced on Day 2). Jakkie wound up making his own stirrup leather out of rope and continuing on, but not before Ed Fernon passed him to take the lead. Jakkie, Ed and Barry battled for the lead over the next few legs with about 20 minutes of traveling time separating them. As race organizers described, over a 1,000 kilometer race that’s essentially photo finish material. Further drama ensued due to the hot weather when Jakkie picked up a vet penalty at Urtuu 27, meaning that Ed and Barry could continue on while he served two hours. Ed and Barry continued on together through the final leg, ultimately crossing the finish line together to share the win. Jakkie earned a well-fought third place, finishing roughly an hour and a half later. All three riders’ horses passed the final vet check, and all three riders (plus their horses) cooled down in the lake together! Leslie appears to be safely checked in to Urtuu 21 for the night. Without any of her gear to help her comfortably handle a night camping in the open on the steppe, this was likely the best decision despite having some riding time still available at the end of the day. As noted by race organizers, self-care along the Derby trail is important. No further details are available on the above-mentioned “fending off wolves” incident, but we’re definitely craving more news on that. We’ll report what we learn. Leslie and the rest of the riders at her urtuu are projected to finish two days from now, and we’ll be there every step of the way cheering our girl home! We’re delighted to see she still has a big smile on her face after seven days of facing what can only be described as myriad challenges on the Derby trail. Emma Manthrope had to cope with a horse that pulled up very lame about 13 kilometers out from Urtuu 20. The vet stationed at the urtuu headed out immediately to treat the horse, who reportedly responded well to treatment and is doing fine in the care of a local family. Mongol Derby organizers noted that injuries in the field involving the horses always take precedence over clearing the riders at checkpoints. 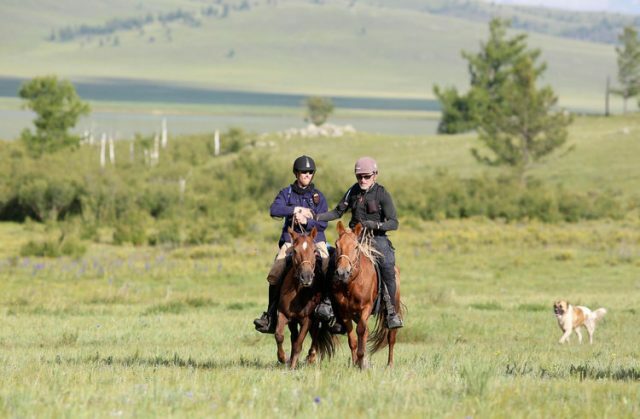 We salute the horsemanship of the entire Mongol Derby team and the obvious care they take with the horses! Most of the other incidents of the day involved Derby vehicles stuck in bogs or running out of fuel — the hazards of such a remote expedition with a fast-moving field! At the close of Day 7 of racing, the EN team sends our heartiest congratulations to co-winners Barry Armitage and Ed Fernon, as well as third-placed Jakkie Mellet. We’re cheering all of the Mongol Derby competitors home! We’ll continue to bring you daily updates from the Mongol trail. You can also follow along via Mongol Derby Twitter (Leslie’s call sign is LW) for live updates. Track the riders via GPS here. Go Wylie! Jenni Autry and Lorraine Jackson contributed to this report. Is Fleeceworks Rider Matt Brown Eventing's Tim Ferriss?